Discussion in 'Documentaries & Pseudo-Documentaries' started by Doctor Omega, Mar 6, 2017. Timothy Treadwell: Hero or Idiot? Grizzly Man is a 2005 American documentary film by German director Werner Herzog. It chronicles the life and death of bear enthusiast Timothy Treadwell. The film includes some of Treadwell's own footage of his interactions with grizzly bears before 2003, and of interviews with people who knew, or were involved with Treadwell, as well as professionals dealing with wild bears. He and his girlfriend Amie Huguenard were killed and eaten by a grizzly bear on October 6, 2003. Treadwell's footage was found after his death. The bear that killed Treadwell and Huguenard was later encountered and killed by the group retrieving the remains of the victims. The final film was co-produced by Discovery Docs, the Discovery Channel's theatrical documentary unit, and Lions Gate Entertainment. The film's soundtrack is by British singer-songwriter and guitarist Richard Thompson. 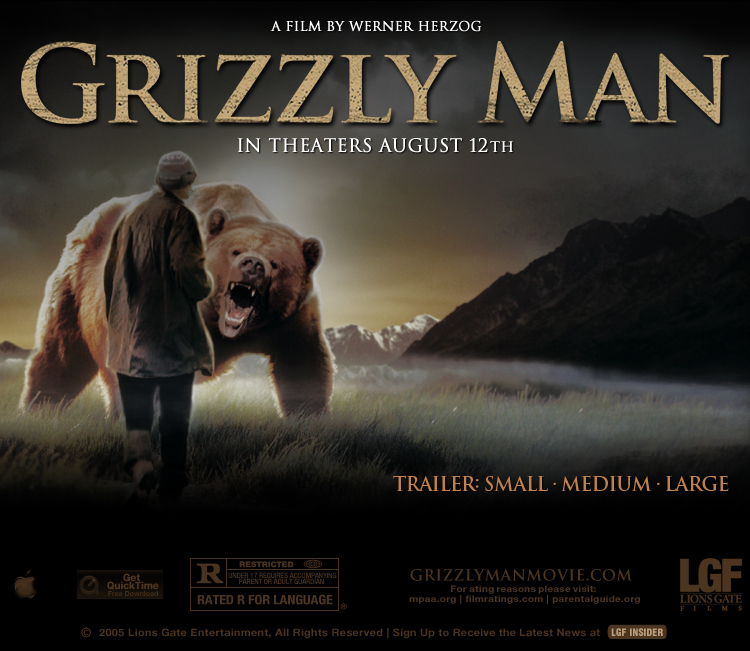 Upon its North American theatrical release, Grizzly Man was acclaimed by critics. On Rotten Tomatoes, the film has a 93% "Certified Fresh" score based on 136 reviews, with an average rating of 8/10. The site's consensus states: "Whatever opinion you come to have of the obsessive Treadwell, Herzog has once again found a fascinating subject. "Metacritic reports an 87 out of 100 rating based on 35 critics, indicating "universal acclaim". "Narrating in his extraordinary German-accented English, Herzog is fair-minded and properly respectful of Treadwell's manic self-invention. He even praises Treadwell as a good filmmaker: as Treadwell stands talking in the foreground of the frame, the bears play behind him or scoop up salmon in sparkling water; in other shots, a couple of foxes leap across the grass in the middle of a Treadwell monologue. The footage is full of stunning incidental beauties." Film critic Roger Ebert, a longtime supporter of Herzog's work, awarded the film four out of four stars. "'I will protect these bears with my last breath', Treadwell says. After he and Amie become the first and only people to be killed by bears in the park, the bear that is guilty is shot dead. Treadwell's watch, still ticking, is found on his severed arm. I have a certain admiration for his courage, recklessness, idealism, whatever you want to call it, but here is a man who managed to get himself and his girlfriend eaten, and you know what? He deserves Werner Herzog." "Herzog is a skillful filmmaker so a large percentage of those who watch the movie Grizzly Man, overlook Timothy's amazing way with animals even though to me this stands out very strongly. The fact that Timothy spent an incredible 35,000 hours, spanning 13 years, living with the bears in Katmai National Park, without any previous mishap, escapes people completely. Even with his city-kid background, I found myself mesmerized by what he could do with animals." The film placed at No. 94 on Slant Magazine's best 100 films of the 2000s. I think Werner Herzog summed it up best during the film. It seemed that Timothy largely turned his back on humanity, and humanised the Grizzly Bears as friends and companions.But Herzog, unlike Timothy, saw no humanity in the bear's eyes and, one day, one of them got bored of Timothy - or hungry - and that was that. He was on their territory and ran out of luck, but that he lasted so long before he ran out of luck is a kind of achievement? This is the scene that has been replaced with a different interview on all DVD versions of "Grizzly Man". "As a biologist currently involved with a study of the damage that Timothy Treadwell did to the Brown Bear population that he interacted with I have to agree with the general sentiment on this page that Treadwell was anything but a friend and guardian to these bear. Since his 2003 death, 7 of 12 bear that he interacted with, who were being monitored by a legitimate scientific study, have died. 2 winter starved the winter of 2004, having become so dependent on Treadwell for help gathering the required sustenance they needed they went into hibernation ill prepared and died in their dens. 3, including the bear the Treadwell referred to as "Mr. Chocolate" had to be put down by park rangers, a danger to themselves and visitors thanks to Treadwell removing their natural fear of man. 2 were killed by hunters having wandered outside of the sanctuary, in both cases the hunters reported that the bear walked right up to them. That is over half of monitored bear known to have interacted with Treadwell dead. What is the legacy of "his" bears that weren't being monitored? Treadwell, and other ecoterrorists like him, are ill informed individuals who make stupid choices, and individuals who make stupid choices are dangerous, to themselves and others."